The Evening Standard has uncovered today that Steve Cox of Faucet Inn is in talks to buy the Royal Vauxhall Tavern. Time and again Faucet Inn, owned by Steve Cox, has tried to convert or close beloved community pubs in pursuit of maximum property profit. Their favoured strategy is to convert upper floors of pubs – traditionally staff accommodation – into luxury flats, which in turn sounds the death knell for the business below. Though Cox has reportedly pledged to keep the Tavern LGBTQ+, this pledge is immaterial if the pub ceases to exist. Don’t forget it was Cox who closed the Black Cap overnight when he was denied permission to convert it into flats – despite its irreplaceable 50-year LGBTQ+ history, and its huge commercial success at the time of its closure. 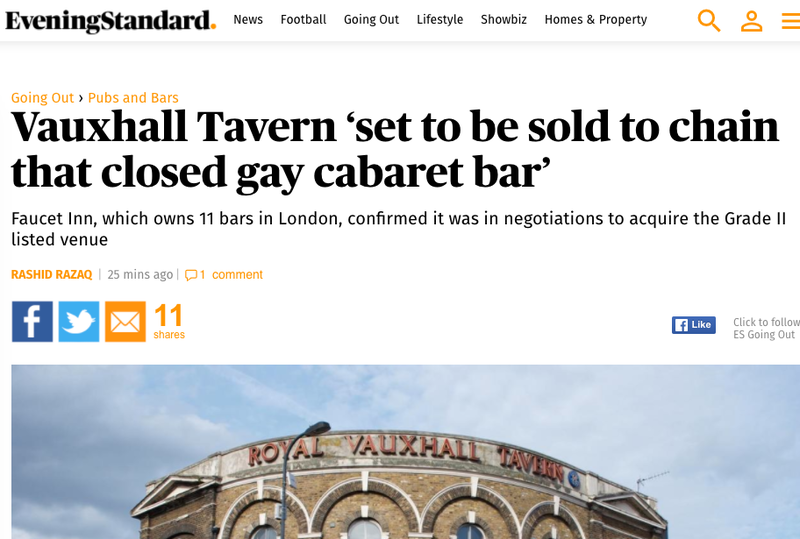 This is why RVT Future’s recent Sui Generis victory is so important, despite lacking specific LGBTQ+ provision – we’ve worked hard to protect the top floors of the Royal Vauxhall Tavern as ancillary accommodation. Any attempt to convert them into private accommodation will be met with fierce resistance from the community and from Lambeth Council. The quadruple-lock of planning regulation around the Tavern, including Sui Generis, is formidable – but it is just not enough to stop determined buyers. Already the RVT’s Asset of Community Value (ACV) status, which should give the community six months to raise money, has been ignored. Immovate are sneakily selling the business which holds the venue, rather than the venue itself – an infuriating loophole which completely goes against the spirit of the law. Having ignored all our calls and emails we can only assume that Steve Cox has no interest in genuinely engaging with the LGBTQ+, or any local, community – an attitude starkly demonstrated by how Faucet Inn robbed London of the Black Cap and closed or redeveloped so many other pubs. To have one sustained community campaign against your ownership of a pub would be unfortunate. To have three (the Black Cap, Dartmouth Arms and Sir Richard Steele) suggests your actions are a disaster. But the buck stops here. Whatever the outcome and whoever any new commercial owners might be, we believe the Royal Vauxhall Tavern will thrive only in community ownership and are pressing ahead with our plans for Britain’s biggest community buy-out. We’re in the process of setting up the Community Benefit Society needed to offer the public shares in the ownership of the pub and our Fighting Fund is gathering steam, with over £15K committed in barely a fortnight. RVT Future now call on Immovate to engage with the spirit of the law and activate the RVT’s Asset of Community Value status. The pub will thrive in the hands of the community, and the community is ready to buy it. We want as many different LGBTQ+ voices as possible to shape the community-owned Royal Vauxhall Tavern. Answering just 20 questions will be invaluable in shaping our plans, identifying how many people would be interested in buying a share of the pub, and in volunteering to help us make all this happen. Fill out the survey here – and please, please share it on social media/by email/letter/carrier pigeon as soon as you’ve pressed submit.